The Simpsons (Classic): "Lisa The Greek"
As the writers and producers have acknowledged, a Simpsons episode centering around the perpetually fraught relationship between Lisa and Homer is never going to be that funny. It’s hard to glean big laughs out of a dour, self-righteous character who prides herself on being a joyless scold. Lisa is the show’s conscience. Your conscience is never going to allow you to have that much fun. Hell, it’s not particularly comfortable with the concept of “fun” in the first place, but we need our consciences, because without them, civilization would crumble into madness and anarchy and everyone would behave like Charlie Sheen. Lisa’s role as the conscience of both the Simpson family and the show is especially important since Homer doesn’t seem to have an internal conscience. In his shameless pursuit of his animal urges, he’s borderline sociopathic so it falls upon Lisa to act as her father’s conscience as well as his daughter. It’s always tricky when children are forced to assume the role of parents to their own mothers or fathers, and Lisa is called upon to do that with distressing regularity. To put it in psychological terms, Homer is pure id, and Lisa is a pure super-ego. In “Lisa The Greek,” Homer behaves abhorrently. 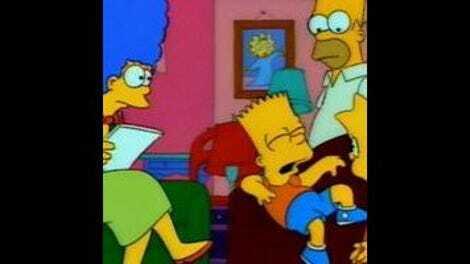 In the audio commentary, the writers concede that an early scene where Lisa asks to sit on the couch and watch football with her father and he grudgingly acquiesces, only to ask her to move further and further and further down the couch until she’s practically slid off of it makes him out to be an absolutely awful father. The show had to establish a profound sense of emotional distance between Homer and Lisa, but it can be hard to forgive a man so unbelievably selfish and self-absorbed he can’t have his precious football watching experience contaminated by having his hopeful and vulnerable daughter within two feet of him. That’s less selfish than horrible and mean. The joke, and it’s a sly and dirty and agreeably subtle one, is that part of Marge’s endless concessions to Homer’s needs and urges are sexual, but her whole spiel struck me as incredibly sad. Loving Homer means sacrificing her will for the benefit of a fat, selfish, oblivious oaf who does not appreciate her sacrifices or even understand them. And now Marge is telling Lisa that that’s pretty much the only way to puncture Homer’s bubble of greedy self-absorption. Lisa can only enter Homer’s worlds on his terms. Within the context of “Lisa the Greek,” that means feeding into Homer’s gambling addiction by picking the winners to upcoming matches with a level of proficiency that puts Jimmy Apollo to shame. Like so many in Hollywood, the writers of The Simpsons are big gamblers. Geeks with money often are. After all, once you’ve build that life-sized recreation of the Star Wars cantina scene in your back yard, what the hell else are you going to spend your Simpsons money on? So the show has enormous fun with the compulsive culture of gambling. I particularly liked Phil Hartman as a Jimmy the Greek-like football expert altogether too proud to have picked the right winner 52 percent of the time (which, technically, is above average, if just barely). Perhaps because they share Homer’s passion, the writers don’t shy away from showing Homer at his ugliest. Lisa episodes tend to bear the unmistakable imprint of touchy-feely Simpsons Executive Producer James L. Brooks, who warmed up with such towering apogees of the sitcom form as The Mary Tyler Moore Show and Taxi. Appropriately enough, the premise for “Lisa the Greek” was actually borrowed/stolen from an old episode of The Mary Tyler Moore Show everyone on the staff apparently remembered very vividly except for Brooks himself. That line has the rhythm and cadence of soothing maternal advice and counsel even if it’s literal to the point of absurdity; of course people who physically attack you because of your clothes are not your friend. 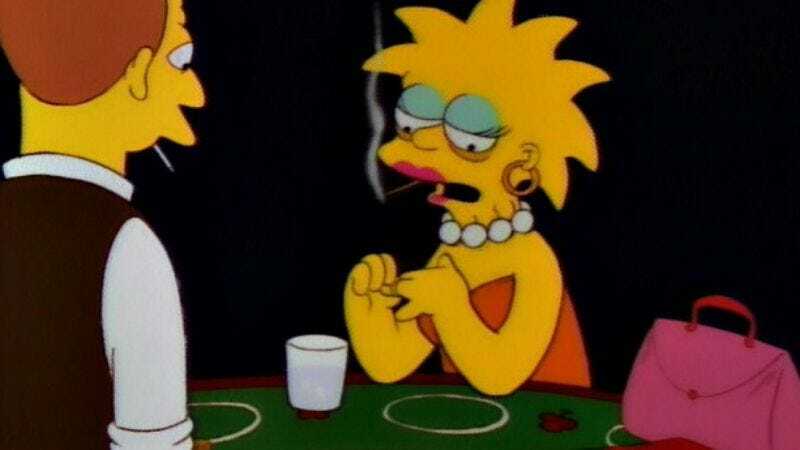 Yet in Marge’s mouth, it sounds soothing and wise all the same. Homer behaves more and more abhorrently until Lisa is ready to give up on him completely. In another bracingly dark moment, Homer says “OK” reflexively when Lisa tells him that she’s willing to tell him the winner of the Super Bowl but that doing so would only validate her conviction that he cares more about the Super Bowl and winning at gambling than her. Yes, Homer digs himself into an awfully deep hole that not even a symbolic good deed at the end could validate him entirely. In keeping with episodes devoted to Lisa and/or Marge, “Lisa the Greek” has an emotional depth and poignancy that sets it apart. Lisa may be a joyless scold, but when the show stopped taking her and her issues seriously, it lost a lot of its soul, and that’s something that’s hard, if not downright impossible, to get back. Marge’s delivery of “Don’t make that face at me” and Bart’s incredulous “How did you know?” also cracked me up in a subtle, understated sort of way. The baseball episode looms tantalizingly in our near future.